Mmmm. Your orange looks luscious, and I love the detail on the one still intact. I can taste these. My mouth waters just to look at it. Love the texture on the outside of the orange, and the background with the swirls - phenomenal! Lookin' nice! Makes my mouth water. Looking good and juicy, the colors are just perfect as well as the shapes. Very well done Debra, I like the background too! Love the background and the juiciness of the oranges. You've arranged them so that the composition is pleasing and you got great shadows. Very juicy oranges! I love your sketches, especially the slippers! This is so beautiful! I love your colors and the contrast between the blue and the orange. And the highlights on the oranges. wow! Nice zesty drawing! 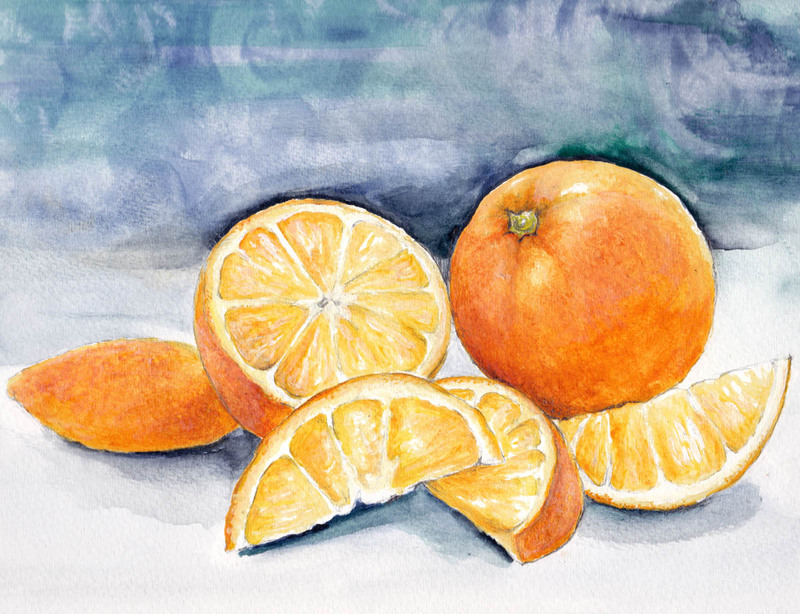 I love the smell and taste of fresh oranges, and this drawing provides just that! Interesting strokes in the background! And of course, the oranges are so realistic looking!